SEVERAL teams from Frome were among the 300 daredevils who took on the Cranmore Tower Zip Wire Challenge for SOS Africa last month, raising money to help children in Africa. After the success of last year’s Cranmore Tower Abseil, during which 160 individuals raised an incredible £12,000, the SOS Africa Charity was asked to create an even tougher challenge for the summer of 2013. With the help of Bruce and Frankie from Cheddar Climbing Caving, and a loyal band of volunteers, they set up a thrilling 100m zip wire from the same venue through the canopy of its beautiful forest. 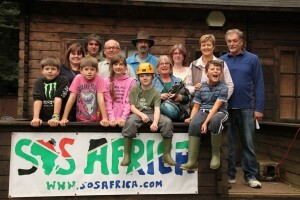 This year SOS Africa, co-founded by a Frome resident 10 years ago to help fund the education of underprivileged African children, also decided to invite other charities to bring teams to fundraise at the event. A 50/50 scheme meant funds these teams raised would be split equally between SOS Africa and these worthy causes, so that smaller organisations also had the opportunity of generating some much needed funding. Frome resident Sarah Hillman for example, brought a 15-strong team to raise funds for her Kenyan charity, Mama Upendo Children’s Trust. More information and event photos can be found on the charity’s website www.sosafrica.com. Or if you would like to get more involved in the work of SOS Africa or join their Shepton Mallet 10k Team, why not pop into their charity shop and offices on the High Street, Shepton Mallet.